So today me and my best friend went shopping for some bits and we went into the body shop to look at their products, as I’ve been advised to recently. We went in there to look at the BB cream and primer which is actually amazing, it automatically adapts to your skin colour, although i didn’t purchase this today due to having to finish my recent bb cream/foundation. However i need to get there quick as at the moment their doing a deal in which you get the primer and the bb cream for a total of £20. 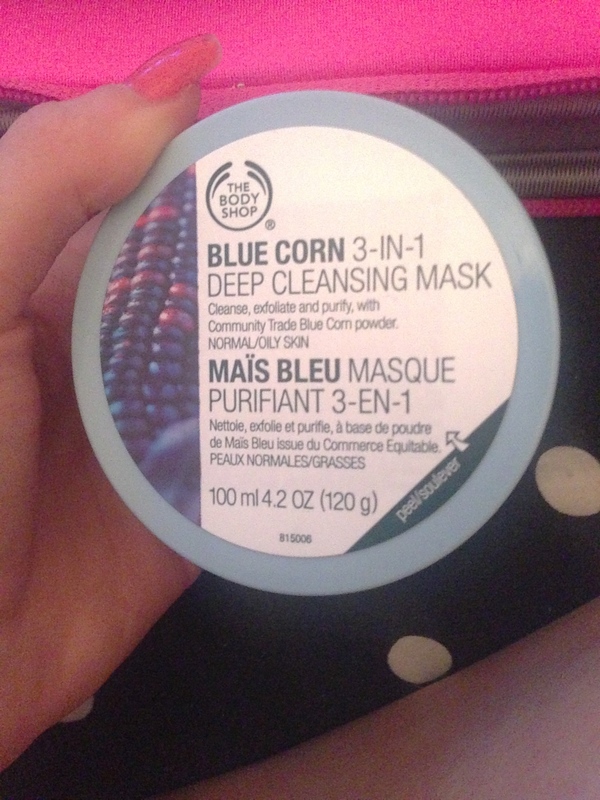 So today i purchased the ‘blue corn 3 in 1 deep cleansing mask‘ I’ve just used this face mask which i was told was good for dry to oily skin and would exfoliate and purify skin whilst preventing spots to a minimum degree. The mask felt so smooth whilst still exfoliating whilst putting it on. It was a tad tingly, i’m not going to lie. However it feels incredible on my skin, then when i took it off, my skin felt even better! My skin is quite dry and i suffer from eczema so finding a product that has natural products in and doesn’t mess with my skin is rather difficult for me, as usually all the products are rather expensive. However for this pot of face mask i paid £10 and received 30% off with my body shop rewards card which i also received today. When i took this face mask to the till, the assistant asked me if i wanted to purchase a rewards card for £5. Although it seems like a lot, every time you use this card when you purchase a body shop product you receive 30% off as well as receiving a free body wash. Not only that but when you receive 4 stamps you receive a £5 product free and 8 stamps is a £10 product, as well as free gifts on your birthday! DEFINATELY worth it. i really love do love the body shop at the moment, not only because their products are perfect for my skin type but also because they are good for any skin type and are of such a reasonable price. I really do urge yo to try them, also they smell amazinngggg!